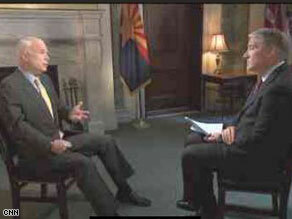 Watch John King's interview with Sen. John McCain Sunday on State of the Union. (CNN) - Despite his campaign-trail promises, President Obama has failed to change the partisan tone in Washington, Arizona Sen. John McCain said Friday. "I'm afraid they have," Obama's former presidential rival told CNN's John King when asked if the administration has 'failed' in delivering on its repeated pledge of bipartisanship. "Look they've got the votes. We understand that. They had the votes in the stimulus package, in the budget, in the Omnibus, in the SCHIP, all this legislation. And they have picked off, sometimes, two or three Republicans," McCain continued. "But that's not changing the climate in Washington." "What that is, is exercising a significant majority," the Arizona Republican continued. "And so I - I respect their successes, but please don't call it changing the climate in Washington." John King's full interview with McCain will air Sunday on State of The Union at 9 a.m. ET. (CNN) - White House Press Secretary Robert Gibbs on Friday mocked the media's coverage of what has been termed the 'Beer Summit' with President Obama, Henry Louis Gates, Jr., and Sergeant James Crowley. "I'm going to go off the cuff for a little bit," Gibbs told reporters during the White House daily briefing. "My favorite was - I'm going to have to pick on my good friends at NBC - 'Ale to the Chief' was the icon…complete with a countdown clock to 6:00." 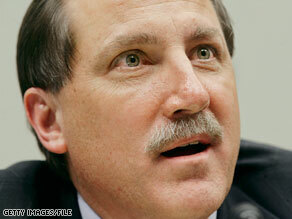 "But here was the topper," Gibbs continued in a disbelieving tone, drawing chuckles from the press corps. "Not only are we calling it the 'Beer Summit.' In stories, [it was] interspersed with other 'summits' of the White House, including footage of Menachem Begin and Anwar Sadat." Hours before the so-called 'Beer Summit' took place Thursday, President Obama also made light of the media's treatment of the event. "I noticed this has been called the 'Beer Summit.' It's a clever term, but this is not a summit, guys," Obama told reporters Thursday. "This is three folks having a drink at the end of the day, and hopefully giving people an opportunity to listen to each other. And that's really all it is. This is not a university seminar." WASHINGTON (CNN) - The Obama administration has made no decision on whether to remove Sudan from a list of terrorism-sponsoring countries, Secretary of State Hillary Clinton said Friday, a day after another administration official spoke in favor of its removal. Sudan is hoping to improve diplomatic ties with the United States, which is now reviewing how best to deal with that government and the crisis in the nation's Darfur region, where an estimated 300,000 people have been killed and more than 2 million forced to fell their homes. "We have made no decision to lift the listing on the terrorist list of Sudan," Clinton said at the State Department during a picture-taking session Friday. "As you know, there is a very intensive review going on within the administration concerning our policy toward Sudan, but no decisions have been made." On Thursday, the Obama administration's special envoy to Sudan made headlines saying there is no evidence to keep Sudan on the terror-sponsor list. Envoy Scott Gration said at a Senate hearing called the terrorism designation "a political decision" and said it is hindering his work. He said lifting sanctions against Sudan would allow heavy equipment and other assistance to flow more easily to people desperately in need. The State Department denies there is any split on Sudan policy inside the administration. A political organization chaired by Newt Gingrich announced Friday that it has raised $8 million since the beginning of the year. (CNN) - Former House Speaker Newt Gingrich's political organization reported Friday it had raised more than $8 million in the first half of the year, a cash haul that significantly dwarfs that which other high-profile Republicans have raised in the same time period. But Gingrich's organization, American Solutions for Winning the Future, is incorporated as a 527 group, and is not subject to the same contribution limits as political action committees - the type of organizations most politicians spearhead, including fellow potential presidential hopefuls Mitt Romney, Sarah Palin, and Mike Huckabee. Unlike PACs, 527s can also directly accept funds from corporations but is barred from directly contributing to a candidate or financing a potential White House bid. 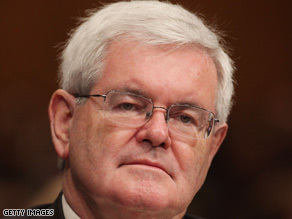 Dan Kotman, the spokesman for American Solutions, said Gingrich was only "one part of the fundraising process." "He played a role as our general chairman, but there were a lot of other factors," Kotman said. President Obama has nominated Daniel Bogden to be the U.S. Attorney for Nevada. WASHINGTON (CNN) - One of the nine U.S. Attorneys whose firings sparked a political uproar is getting a second chance at the job. After being pushed by Senate Majority Leader Harry Reid, D-Nevada, for several months, President Obama is nominating Daniel Bogden to again hold the post of U.S. Attorney for Nevada. "I am extremely honored that President Obama has nominated me," Bogden told CNN in an e-mail message. "I sincerely appreciate the opportunity this nomination presents for me to return to public service...so I can again pursue justice on behalf of the citizens of Nevada and the American people. Bogden, one of 4 picks for U.S. attorney posts the White House announced Friday, said "I look forward to the challenge and great opportunity to again lead" the U.S. Attorney's Office. "These fine men and women have demonstrated the extensive knowledge of the law and deep commitment to public service Americans deserve from their United States Attorneys," Obama said. "It is with the utmost confidence in their ability and integrity that I nominate them for the weighty task of pursuing justice on behalf of the American people." 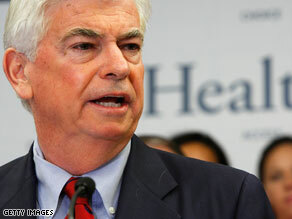 Sen. Chris Dodd is expected to announce Friday that he will be treated for early-stage prostate cancer. (CNN) - Sen. Christopher Dodd announced Friday that he has an early form of prostate cancer, but said he is going to be fine. "I feel fine; I'm going to be fine. We caught this early," he said at a news conference with his wife, Jackie Clegg Dodd. He will undergo surgery after the Senate adjourns next week, Dodd said. Dodd, 65, is expected to face a tough re-election campaign in 2010. He stated emphatically Friday he still plans to run. "The condition was caught extremely early," said a source close to Dodd, who added that the procedure is routine, and the senator's health "is otherwise superb." "This in no way whatsoever affects his re-election plans," said the source. UPDATE: Dodd sent his supporters a message Friday afternoon confirming the report. NEW YORK (CNNMoney.com) - A lot was supposed to happen on health reform before Congress went on summer vacation. Turns out, a lot didn't. End result: The heavy lifting on health reform legislation has been pushed to the fall. A bipartisan group of six senators from the Senate Finance Committee was supposed to unveil its health reform bill - or at least an outline. But the group couldn't resolve some outstanding issues such as how to make sure the health insurance structures they're proposing end up being affordable. It's also unclear whether the group will release a draft before the start of the Senate summer recess next Friday. That means the full committee, to say nothing of the full Senate, won't begin to debate the proposal until the leaves start turning a lovely autumn orange. Meanwhile, House leaders had been promising a full floor vote on health reform before the congressional recess, which begins on Saturday. But that idea was tabled once it became clear that the last of the three committees - the Energy and Commerce Committee - wouldn't report the bill out of committee until the 11th hour. That means the full House won't take up a health reform bill before fall. 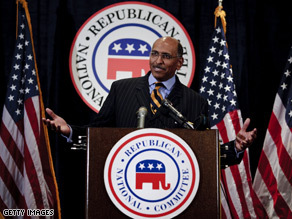 SAN DIEGO, California (CNN) - Republican National Committee Chairman Michael Steele called on state GOP leaders Friday to roll up their sleeves and help rebuild the party voter-by-voter, warning them that the Obama White House is already looking ahead to the 2012 presidential election. "Do you really think Rahm Emanuel is sitting back saying, 'Yeah, you know we got this,'" said Steele, a reference to the White House chief of staff who is known for his bare-knuckle approach to politics. To compete politically, Steele said that GOP leaders need to embrace new media to spread the Republican message in their states, while engaging in weekend voter registration drives to help grow the party. In return, Steele promised to devote RNC resources to help build the state parties' infrastructure. "We need to be prepared to move quickly to respond" to the Obama White House, Steele said to the RNC members meeting this week in San Diego. 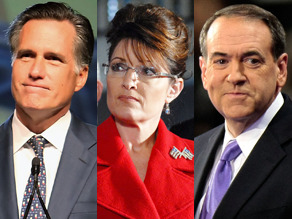 Mike Huckabee trails Sarah Palin and Mitt Romney in fundraising through the first half of 2009. (CNN) - Recent polls show he is among the early frontrunners for the 2012 GOP presidential bid, but when it comes to fundraising this year, former Arkansas Gov. Mike Huckabee trails well behind his chief rivals. The former Republican presidential candidate e-mailed supporters Thursday night announcing he has raised a little over $300,000 in the first six months of the year, a cash haul that is only about 20 percent of the $1.6 million former Massachusetts Gov. Mitt Romney took in the same period. It's also about a third of what former Alaska Gov. Sarah Palin has raised since January. Her political action committee, SarahPAC, reported raising $730,000 through July 1, but a spokeswoman for Palin said the Alaska Republican took in an additional $200,000 in the early days of July after announcing she was stepping down as governor. Several recent surveys - including one from CNN/Opinion Research Corp. - show Huckabee is roughly tied with Palin and Romney in an early assessment of where the 2012 Republican presidential race stands. Palin's schedule has been the object of confusion for months. 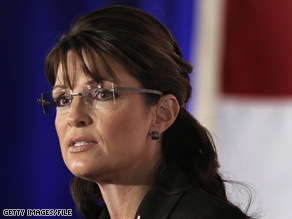 WASHINGTON (CNN) - Despite an earlier announcement from a California Republican women's group, former Alaska Governor Sarah Palin will not be speaking to an event sponsored by the group scheduled for next weekend at the Ronald Reagan Presidential Library, a spokeswoman for her political action committee said Thursday night - the latest such high-profile incident of confusion over the governor's schedule over the past few months. “As repeatedly stated to several in the media over the last week, former Governor Sarah Palin is not committed to attend the Simi Valley Republican Women’s event at the Reagan Library and in fact is not attending the event,” read a statement from Meghan Stapleton that was posted on Palin‘s Facebook site. Stapleton said Palin “has other work and commitments to take care of at that time” but did not elaborate. Palin has been plugged as a headliner at several major events - including the annual Conservative Political Action Conference, and a major GOP fundraiser in Washington this spring - after organizers of the events believed they had received assurances from her representatives, only to learn that either the former governor's aides in Alaska or her staff at SarahPAC had been unaware of the commitment. That set of advisors would then announce publicly that Palin had never planned to attend the event.